I usually try to make zoo animals look their best, but I couldn't help taking this shot. For those of you that shoot at the Columbus Zoo, you know the Markhors, a rare goat native to the Western Himalayas. When they were first added to their enclosure at Asia Quest, the rock climbing male promptly shot right up the wall that was supposed to enclose him, prancing on the roof of the exhibit above the viewing area. It seems that each time I see these fascinating creatures, there is more fencing installed in the enclosure. Have they had multiple escapes? I'm not sure, but I wouldn't doubt it. 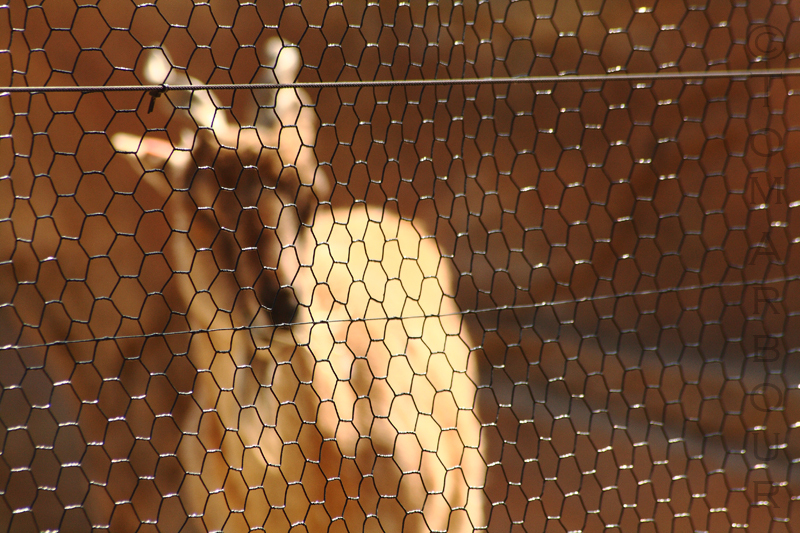 Still though, this is one of my favorite exhibits at the zoo, I just wish there wasn't so much chicken wire. I guess I'm being somewhat selfish. I'm showing this image not to rail against captive aniamls, but to vent my frustrations about how smart and athletic these creatures are that they could easily escape an enclosure that I'm guessing was specifically designed for them, and is now partially wrapped with wire which makes it quite a challenge to get a clean image. Very interesting perspective - I like it!